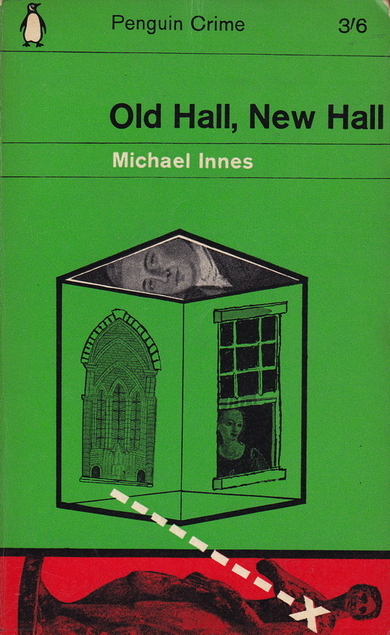 Old Hall, New Hall by Michael Innes was first published by Gollancz in 1956 but my copy is a 1964 Penguin Crime paperback. I’m one of those readers who prefers my vintage crime reading to be of the sort where a crime takes place almost immediately. I was to be severely disappointed by that aspect of the book as the author spent an awful lot of time ‘vamping til ready’ – as I call it. Despite that I did enjoy reading this book, I just think that it was wrongly marketed. Michael Innes also wrote under the name J.I.M. Stewart and those books tend to be the ones that are set at a university, in his day job he was a professor of English literature at various universities, ending up at Oxford. Colin Clout is a young unemployed academic, desperate for work. When he goes back to his old college his luck seems to have turned immediately as he meets Olivia a fabulous looking girl, and then his old professor offers him a chance of the Shufflebotham Fellowship (there are a lot of odd names in this book). The university is quite a new one and the buildings had belonged to a local landowner originally and some of the previous generations of the Jory family had been rather strange. They now live nearby and it’s thought that there might be some treasure buried somewhere around Old Hall’s grounds. It turns out that the gorgeous Olivia is distantly related to the Jorys and she thinks that her branch of the family have been done out of the treasure – if indeed it exists. One character is mentioned briefly twice – a deceased dotty Aunt Elizabeth who had apparently been under the impression that she was a barouche landau carriage! She spent her time attracting the attention of gentlemen she judged to be likely to be skilled with reins. What a scream, I so wish she had had a higher profile in this book. I kept waiting for a crime to occur – as it’s a Penguin Crime paperback, but it never did. Edinburgh by Robert Louis Stevenson was first published in 1878 but my copy is a lovely edition published by Seeley and Co in 1905. It’s leather bound, gold edged with thick cream pages. Obviously this one comes under his travel writing, not that he had to do much travelling to write about his home town of Edinburgh. In Chapter 1 Stevenson describes the beauty of Edinburgh and there’s no doubt it is beautiful, as well as being unique, in fact I’ve witnessed tourists’ jaws actually dropping when they see the castle rock from Princes Street. The ancient and famous metropolis of the North sits overlooking a windy estuary from the slope and summit of three hills. No position could be more commanding for the head city of a kingdom; nor better chosen for noble prospects. From her tall precipice and terraced gardens she looks far and wide on the sea and broad champaigns. To the east you may catch at sunset the spark of the May lighthouse where the Firth expands into the German Ocean; and away to the west, over all the carse of Stirling, you can see the first snows on Ben Ledi. But it’s not long before R.L.S. goes on to describe the downside of living in Edinburgh – and it’s hilarious. But Edinburgh pays cruelly for her high seat in one of the vilest climates under heaven. She is liable to beaten upon by all the winds that blow, to be drencched with rain, to be buried in cold sea fogs out of the east, and powdered with the snow as it comes flying southward from the Highland hills. The weather is raw and boisterous in winter, shifty and ungenial in summer, and a downright meteorological purgatory in the spring. The delicate die early, and I, as a survivor, among bleak winds and plumping rain, have been sometimes tempted to envy them their fate. So there you have it, R.L.S. obviously had a love/hate relationship with his place of birth, and no doubt Edinburgh’s atmospheres of genteel civility on one hand – and dark and menacing on the other played a huge part in his writing, particularly of Dr.Jekyll and Mr.Hyde. Rosabelle Shaw by D.E. 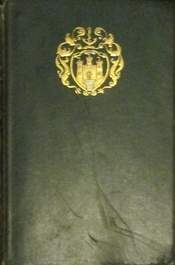 Stevenson was first published in 1937. I’ve wanted to read this book ever since I realised that D.E. Stevenson had named a character Rosabelle. I was at school with a girl with that name and I’ve never heard of anyone else having it – well not until I read about the tragic drowning of Rosabelle of Ravenscraig Castle which inspired Sir Walter Scott to write a poem which you can read here. 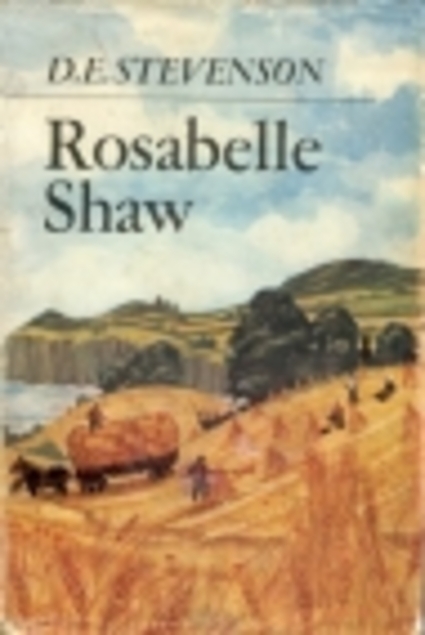 Rosabelle Shaw is set in Scotland, it begins in Edinburgh 1890 where Fanny quickly ends up marrying and moving to a new life in rural Scotland where her husband John is a farmer. Rosabelle is their first-born but as you would expect John is keen to have a son eventually, but when a ship is wrecked on the nearby rocks the only survivor is a baby boy. John does his best to track down the parents but has no success. Unfortunately Fanny has already bonded with the baby which she names Jay, and she has no intentions of giving him up anyway. From the beginning the child comes between the couple and things only get worse as the years go on. 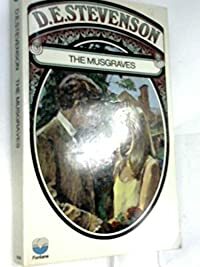 I ended up enjoying this one although for a large part of the book the manipulative and deceitful nature of Jay and the way that Fanny puts Jay before her own children and husband made it an uncomfortable read, but it eventually ends well for the Shaw family. I might be reading too much into D.E. Stevenson’s writing but it seems to me that she often gives a wee nod to other Scottish authors, there’s the use of the unusual name Rosabelle – a nod to Scott, and I don’t think it’s a coincidence that the house of Shaws appears in Catriona – Robert Louis Stevenson’s sequel to Kidnapped. I rather like the cover of the 1967 edition of the book which I managed to borrow from the Fife libraries reserve stock. It looks like an authentically Scottish scene for the historical setting. 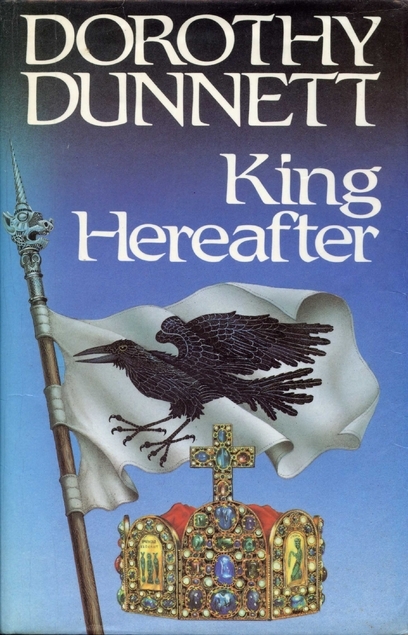 King Hereafter by Dorothy Dunnett was first published in 1982 and as is usual with Dunnett’s books it’s a weighty tome with 721 pages. I loved this one, it’s one of those books that I just didn’t want to end and I felt quite bereft when it did – and of course it’s a stand alone book so I won’t be able to meet up with any of the characters in the future. I’m so glad that we travelled to Orkney last year because I had been to all of the locations mentioned there and everywhere else in Scotland, even the small historic town nearest to where I live got a mention. In this book the author has decided that the Viking Thorfinn Sigurdsson and Macbeth are one and the same person, with Thorfinn taking the name Macbeth when he was baptised a Christian. Times were very violent in 11th century Scotland and leaders/kings often didn’t last all that long back then with Viking raiders and more local rivals vying to be top dog. So as with Dorothy Dunnett’s other books – it’s all go – never a dull moment. I found this one to be a lot more straightforward than some of her others. The endpapers feature a detailed family tree of the Kings of Scotland (Alba) and the Earls of Northumbria (England), but I didn’t need to refer to them. I can imagine that I’ll re-read this one though as I’m sure I’ll get even more enjoyment out of it the next time around. As it happens I was walking in Birnam Wood a couple of days ago, but I did a post about it way back in 2010 (where does the time go?!) so if you want to have a look at some of the ancient trees have a look here. The photos don’t give an impression of how big they are. The Musgraves by D.E. 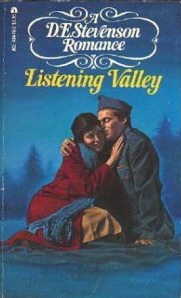 Stevenson was first published in 1960. Esther and Charles Musgrave have been married for 25 years but they’re not destined to add any more years to that tally as Charles is terminally ill. He was a widower when he married Esther and is much older than her. His 17 year old son Walter reacted badly to the marriage and took off in high dudgeon to make a life for himself, cutting off all contact with his father. All that is in the past though and it’s Esther and their three daughters that are preying on Charles’s mind in his last days. Delia the eldest daughter has always been difficult, she has never quite got over not being an only child and having to share her parents with two younger sisters. She’s a needy and dissatisfied young woman and likes everybody to know it, with the result that the other members of the family are walking on eggshells when she’s around. Meg the middle daughter is going to be married to Bernard soon, but her mother isn’t at all happy about the match. Charles is obviously keen to get Meg settled with a steady husband, looking to the future he knows that Bernard will be a help to his family when he’s no longer around to look after them. Esther doesn’t like Bernard and is really quite a hypocrite considering her far more mismatched but successful marriage with Charles. Rose, the youngest daughter is packed off to school and with Charles’s death and Meg’s marriage Esther is living with just Delia in the much smaller house that they’ve had to move to when it became a financial necessity to move out of their large family home. Delia isn’t happy with the change in their circumstances, living in a large house with plenty of land around it had been important for her ego and she feels the downfall keenly. Esther is delighted with the new house though, it’s just Delia’s personality that is a problem. I enjoyed this book about difficult family dynamics and clashing personalities. It’s often the middle child in a family who is supposedly the difficult one so I’m told, but I think that quite often the eldest child comes as such a shock to some mothers, especially if they are young mothers and are an only child themselves. I’ve certainly observed some young mothers treating their eldest as if they are a sibling that they never had and not their child. By the time they have a second child they’re ready to get into mothering mode so the relationship is very different. It’s harsh on the eldest child. Perhaps that was part of Delia’s problem. Although I prefer D.E. Stevenson’s books to have a Scottish setting (so parochial of me I know) I did enjoy this one. The Ringed Castle by Dorothy Dunnett was first published in 1971 and my copy seems to be a first edition. I love the dust jacket. It is of course the fifth book in the Lymond Chronicles. Philippa has returned from Turkey. She has contracted a marriage of convenience with Lymond, the plan is they will have the marriage annulled within a few years, that should be easy as it hasn’t been consummated. 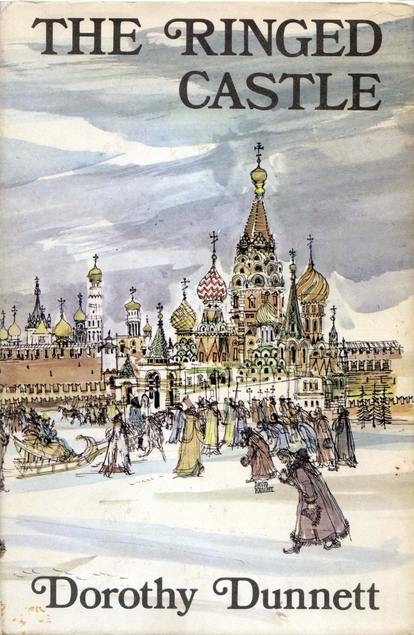 Meanwhile Lymond has travelled to Russia with his band of mercenaries and it isn’t long before he has gained yet another title – Voevoda Bolshoia, head of Tsar Ivan the Terrible’s army. Any position that brings you close to Ivan is a precarious one as his moods and rages are a danger to all around him. But Ivan is keen to modernise his country and to bring wealth to it through trading. Reluctantly the Tsar parts with Lymond to allow him to sail to England with ships full of goods and Osep Nepeja who is to be the first Russian ambassador to England. In England Mary Tudor is Queen and married to Philip of Spain. She is praying to have a child and is busy having thousands of Protestants burnt at the stake as offerings to her God, presumably hoping that she’ll be sent a child from God for doing her best to support Catholicism. Life in England is almost as dangerous as life in Russia. I loved this one and went straight on to Checkmate, the last in the Lymond series. 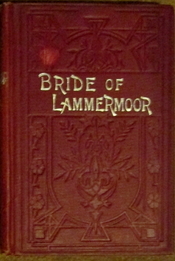 I was quite pleased to get The Bride of Lammermoor by Sir Walter Scott for my Classics Club Spin book, because I often need my arm twisted a wee bit to get down to reading more of Scott’s books. I don’t know why that should be because I invariably enjoy his work. My copy was published by Richard Edward King and is apparently a first edition, but not worth all that much. Presumably thousands of them were printed. I had to cut a few of the pages so I suspect that I’m the first person to finish this edition. It was first published in 1819 but in its day it was a historical novel, set after King James VII had been deposed. The story begins with the funeral of the Master of Ravenswood, he had lost his title because he had been on the Jacobite side, and after a protracted battle with a devious lawyer he has lost almost all of his property. Edgar his son and the new laird of Ravenswood is left with only a ruin to live in with a couple of old loyal family servants who would no doubt never have been able to get a job elsewhere. Edgar despises the lawyer Sir William Ashton, seeing him as the reason for his family’s downfall, and to make matters worse Sir William is now living on the old Ravenswood family estate. While visiting his old nanny in a cottage on the estate Edgar meets Lucy Ashton and becomes infatuated with her. Their relationship develops but when Lucy’s manipulative and controlling mother learns of it she’s determined to put a stop to it. This story has elements of lots of old tales – Romeo and Juliet being obvious but Scott used a lot of traditional Scottish Border folk tales and ballads in his books apparently. Despite this being a tragic romance there’s quite a bit of humour involved, and I really enjoyed this one. Lucy keeps rather a low profile for most of the book but this tale seems to have been very popular in many countries and it was even made into an opera by Donizetti in 1835, based loosely on the book. Aiding and Abetting by Muriel Spark was first published in 2000 and it’s the second last book that she wrote. I’ve found Spark’s books to be distinctly uneven and quite a few in my opinion are over praised and I have a theory about that but – later. Having said that though I found this one to be a lot more entertaining than I expected it to be given the blurb on the back. Normally I’m not all that keen on fiction which involves real people as characters but in this case it works and is acceptable I think. The actual person involved is Lord Lucan and I well remember watching the news one evening in 1974 – Lord Lucan was missing and his wife was seriously ill in hospital having been battered by him, the nanny had been bludgeoned to death. Lord Lucan was helped by his rich and influential friends and he never was hunted down despite being sought all over the world. In this book a well-known and very successful psychiatrist Dr Hildegard Wolf is surprised when a man walks into her consulting rooms claiming to be Lord Lucan. He wants her help, she has a strange way of treating her patients as she spends her time talking about herself, but charges the patient a huge fee at the end of each consultation, you have to be wealthy to be able to consult Dr Wolf. What puzzles Dr Wolf most is that she now has two patients claiming to be Lord Lucan and they both look like him. She wonders if they are working together somehow and have some ulterior motive. As Dr Wolf has a big skeleton in her own cupboard she’s very worried. This is quite a dark book, but also amusing, I can’t make up my mind about its rating on Goodreads but I’ll probably be generous and give it a 4 as it merits more than a 3. Now a bit about my theory on Muriel Spark’s reputation. I know that she was a bit of a party animal and she made friends with lots of well-known and successful writers who no doubt helped her a lot when she was forging her own writing career. Nowadays we would probably say that she went on a charm offensive! I suspect that there were plenty of other people writing better books at the time who never got them published due to not having the right connections, but such is life. The other thing that strikes me about this Penguin copy of the book that I have is that it dates from 2001 and it cost £7.99 or an eye-watering $16.99 Canadian dollars. It has 210 pages, but the print size is massive, it could almost be described as being large print so if it had been published with a more normal print size the book would have been less than half the size it is. Back in the good old days Penguin would have published this novella along with another of her novellas (I have at least one of those Muriel Spark still slim volumes) and the price would have been the same as one normal sized Penguin book. So in 2001 we were being fleeced and probably still are! The Two Mrs Abbots by D.E. Stevenson was first published in 1943 and my copy is an original hardbak, sadly minus the dustcover. It’s the third book featuring Barbara Buncle although she is now of course Barbara Abbot as she’s now married to her editor Arthur and they have two small children, a boy and girl. Barbara is kept busy as a mother, wife and with various war work that she’s involved with, so she has given up her writing for the duration. She’s also the type of person that ends up helping everyone else and giving them her time, and often gets little thanks in return. I think a lot of women will recognise the situations she finds herself in with selfish individuals around her. As you would expect there’s the usual trouble about rationing and evacuees although it’s not the children who are a problem but the mother. The other Mrs Abbott is Jeronina, usually known as Jerry (a blight on her considering who the enemy is in WW2). She’s married to Arthur’s nephew who is in the army doing his bit in Egypt (possibly). She’s not alone though as Markie her old governess is living with her, and they’ve also had a whole battalion of soldiers billeted on them. D.E. Stevenson was of course Scottish and if she didn’t set her books in Scotland she often had some Scottish characters in the book. In this one Markie is from Fife and she’s thrilled to discover that one of the soldiers is also a Fifer, well they are very clanish! There are various stories in this one, quite a lot of characters, one being a young female writer of romances that are very popular but not the sort of thing that Barbara and Jerry are impressed with. I’m wondering who it was that D.E. Stevenson was thinking of when she wrote that character! There’s plenty of wit and charm as you would expect but this one isn’t as funny as Miss Buncle’s Book, it’s still well worth reading though.